Copyright London Metropolitan Archives, City of London. COLLAGE 82260: Catalogue ref. SC/PHL/01/209/AV62/1401 Edenham Street, 1962. Two places where I deposited some of my pocket money – the Post Office and, to the left, Wardle’s sweet shop. When Dad thought I was more responsible, he started giving me pocket money. He was paid monthly and thought I would learn to manage my money better if he paid me monthly too and so it was that I got £1 a month. It was tricky to make sure the money didn’t run out before the month and there was plenty of temptation to spend it. I always had to buy sweets to eat while watching Dr Who early Saturday evenings and, for some reason, I usually left it to the last minute before sprinting round to either Wardale’s in Golborne Road or Ada Smith’s in Kensal Place. The Wardales were usually in their back room watching their television, which was very high up and appeared to be on the top of a wardrobe facing the shop while they had their backs to the shop so they weren’t always that swift in coming into the shop to serve. Likewise Ada was the biggest woman I have ever seen and walked at a shuffling snail’s pace so either way, it was always a challenge to get back before Dr Who started. 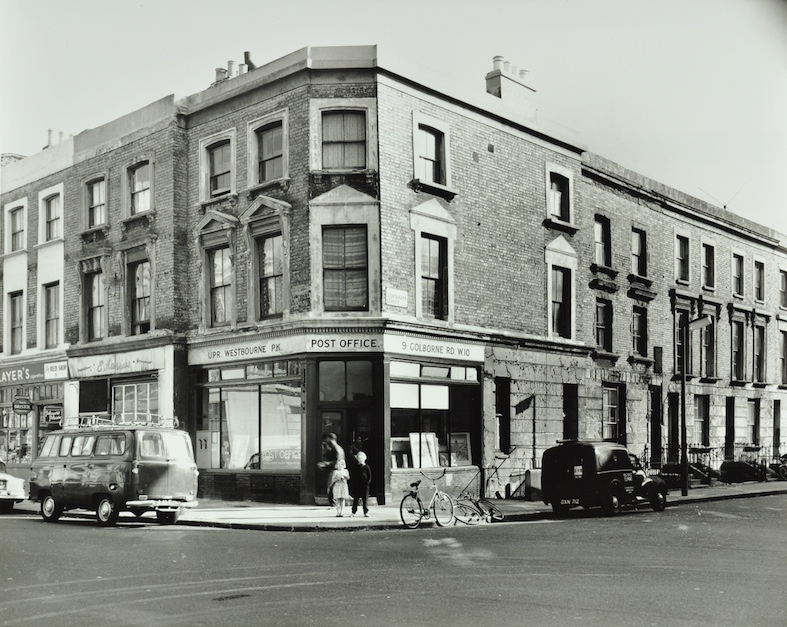 My dad wanted me to save some pocket money and I usually managed to put a minimal amount into my savings book each month in the post office at the corner of Golborne Road and Edenham Street. Further down Golborne Road on the left over the iron bridge, however, there was a toy shop, where I went from time to time to add to my Corgi and Matchbox car collection. I always looked forward to the release of the new Corgi model catalogue and would pore over it deciding what to buy next, although, at fifteen shillings, the James Bond DB5 with ejector seat, machine guns and other impressive gadgets, was always out of reach. I later spent more time in the record department in Harper’s, where I started my record collection. In the days before the introduction of prices ending with 99 (new) pence, I can remember singles cost six shillings and threepence before going up to six and eight so this was a major investment out of my pocket money. Woolworth’s sold cover versions of many hit singles on their own Embassy label and these were cheaper but they were almost as bad as the records I occasionally liberated from the boxes outside the factory in Kensal Road. My records would be played at home on our grey and red Philips portable record player, which had a folding lid and carrying handle in the style of a lot of players at that time. The volume never bothered our neighbours, even when pushed up to maximum because it certainly wasn’t a match for the Cullen’s radiogram downstairs, which often boomed out the bassy sounds of Jim Reeves on Sunday mornings, not that I ever heard my parents complain about noise from our neighbours. Anyway, they were probably in no position to complain as I’m sure the Cullens could often hear me running around over their heads, not mention the Old Man’s Zorba like dancing on his occasional visits. I think everyone accepted the odd bit of noise as a natural consequence of living in close proximity with their neighbours. I don’t recall dad actually liking any kind of music although he was quite happy to listen to music of the ‘Two Way Family Favourites’ kind on the radio. My mum, though, enthusiastically supported my new interest even though Duane Eddy, with his twangy guitar of course, and the Shadows were my early heroes when my mum preferred the likes of Russ Conway and Percy Faith and his Orchestra. For much anticipated new releases by the Beatles and the Stones, I ordered their new singles in advance so I could collect my copy on the day of release or usually it was my mum who collected them for me, to give me some bragging rights by being among the first to hear their new single in the days when pop music didn’t have the blanket media exposure it did later. By the way, there was a pawnshop further along on the corner of Golborne and Bevington Roads and I mention it because it had the traditional pawnbrokers’ sign of three brass spheres hanging from an ornate bar high up the wall. Golborne and Portobello Road markets don’t seem to have changed much over the years. There were probably more stalls selling fresh fruit, veg and other food then as street food hadn’t yet been invented, in England anyway, and second hand clothes stalls at the Golborne Road end of the Portobello market, which were a lot less salubrious than the vintage clothing on sale now. There was also usually a large van just before the railway bridge in Portobello Road piled high with towels, bedding and other household goods, which often drew a crowd while the seller put on a performance along the lines of ‘I’m not asking for a pound, I’m not even asking for ten bob, move closer madam, look at the quality, I’m giving them away, here, two for ten bob’. Up the hill towards Westbourne Grove, as now, the stalls sold antiques and upmarket bric a brac. In the days before computer games, boys did a lot of collecting and collecting coins was quite popular. This was helped because, even in the 1960s, there were still halfpennies and pennies in circulation dating back to the 1860s so there was real history to be found in our change. A lot of the coins were almost worn flat but it meant that boys could start their own collection for not very much. Anyway, a boy came to school one Monday showing off a gold George III coin called a spade guinea, which he said he had found in the gutter after the stallholders at the top of the hill had cleared away. That was a lucky find or maybe it was more than luck. Another boy I knew at school supplemented his pocket money by stealing Matchbox models to order from Woolworth’s in Harrow Road and selling them for half price. While on the subject of collecting, I collected Brooke Bond tea cards, supervised by my mum, which always featured educational subjects like ‘Wild Flowers of Britain’ and ‘Wildlife in Danger’. I imagine we bought vast quantities of tea as I always got close to, but never quite, completing each set. They were free as my mum bought the tea of course but worth paying for was a series of trading cards in packets of bubblegum featuring the American Civil War. These were swapped enthusiastically by a lot of the boys in my class and featured gory scenes of soldiers being bayonetted, crushed, blown up, burned or, probably if they were lucky, merely shot. Another draw on my money slightly later was football as we would sometimes get together in the playground on Friday and decide to go to a football match the next day. We would either meet at the number 28 bus stop opposite Westbourne Park station and take the bus to Stamford Bridge or meet at the station to take the train to Shepherds Bush for Loftus Road. Standing on the terraces at Stamford Bridge cost two shillings for boys and a programme was sixpence, the same cost as the bus fare, so football on Saturday was easily affordable from my pocket money and something we could decide to do almost on the spur of the moment, usually about once a month. As the turnstiles at Stamford Bridge stood on Fulham Road at that time, fans could move about freely once inside behind the stands and opposing sets of fans would often pass each other to change ends at half time without any trouble. One time, we set out at our usual time to watch Chelsea play Manchester United and the crowd at the turnstiles was immense. Adults were pressing in on our small gang from all sides, the crowd was barely moving and we could hardly breathe. As much as we wanted to see the match, we were in fear of injury more and decided to struggle, with difficulty, against the crowd to get out. My income was supplemented slightly by being in the church choir at St Helen’s just off St Quintin Avenue. I got sixpence for attending Friday evening choir practice and Sunday services and two shillings and sixpence for a wedding and, once, we sang at two weddings in one day so that felt like a real pay day. It was an impressive choir comprising a large contingent of male and female choristers and equally large contingent of slight rebellious boys with angelic voices. One year, for weeks before Easter, we practiced singing the, for me anyway, very difficult Matthew Passion by Bach but we all had a great sense of achievement when we sung it on the day. I would walk either with my friend Bob or on my own to and from choir practice in Barlby Road without any problem. However, I had a narrow escape when walking to choir practice one dark night when crossing the road at the zebra crossing at Ladbroke Grove as a speeding car came out of nowhere and caught me a glancing blow and sped off without even braking. Other than a badly cut leg, I was ok but, if I had taken just one more step forward, it would have been much more serious. Somehow, my parents thought it was my fault and they really didn’t want me to go again but they relented in the end. A while later, I joined a Boy Scout troop, which met somewhere in Paddington. We wore traditional khaki uniforms with shorts of course and campaign style hats and probably looked like extras from It Ain’t Half Hot Mum, although that was on television much later. The troop met on Friday evenings at the same time as choir practice but learning handicrafts and playing boisterous games was a lot more fun than singing hymns. I didn’t have to buy my own comics as mum bought me the Beano and the Dandy, which I couldn’t wait to read each week, and dad bought me Look and Learn, which as the name suggests, was more educational, but I found harder going. Birthdays and Christmases were always a treat. Our front room was always highly decorated for Christmas with paper chains and lanterns hanging from the ceiling and a real tree, which was decorated with glass baubles and lights of course. One year, our tree started to shed its needles early on and, as my parents carefully took the decorations off one by one when Christmas was over, there was a series of heavy downfalls of needles until it looked like it has been napalmed. They bought an artificial tree the following year. I always got a very nice present for Christmas. Some of the presents that still stand out from that time were a Meccano set, a Hornby Dublo train set, a chemistry set, and a Kodak Brownie camera. A trip to Bertram Mills circus at Olympia was a regular Christmas outing. A traditional circus may seem slightly outmoded and non-PC now but the clowns, acrobats and animals performing various tricks seemed an absolute spectacle then. Just before Christmas too, we would board a bus at Notting Hill Gate to see the Christmas lights in Oxford Street and Regent Street after what always seemed like a long and freezing wait at the bus stop. We would always try to get the seats at the front of the top deck if we could as the lights were really something to see at a time before almost every High Street had some form of Christmas lighting. The sight of the enormous Christmas tree in Trafalgar Square always capped a rare evening out in London. I mentioned before that we would sometimes go to the cinema. Our usual venues were the Cartoon cinema in Baker Street or the Odeon in Westbourne Grove, where I remember seeing the X rated Forbidden Planet with my parents. They were keen to see the film and couldn’t find anyone to babysit their four year old so they took me along on the off chance. The usherette let us in anyway as she said it would all go over my head or words to that effect and it did but the futuristic music and Robby the robot made an immediate impression. The one cinema we never went to was what most people called the flea pit or or ‘bug’ole’ in Portobello Road although, how times change, it seems quite trendy now. Other than the cinema and days out in central London or out to the ‘country’ like Richmond Park, entertainment was limited and eating out was something I only remember we did once. The closest we often got to that was a Friday night treat of fish and chips from the Greek Cypriot fish shop just over the iron bridge although mum sometimes took me to the Wimpy Bar in Westbourne Grove. My dad spent a long time in hospital after collapsing while cycling from work and, evidently, it was thought that I may have similar problems with my chest as my mum would take me to what we knew as the chest clinic just off Westbourne Grove for regular check ups. The large X ray machine, and the fact that the adults always left the room before switching it on, was always slightly frightening but not at all painful unlike the dentist so, for being good, I was usually taken for a Wimpy or two. Only once, when I must have been only about five years old as my younger brother hadn’t yet been born, the three of us went out to dinner, and it must have been a special occasion because this was at the Ognisko in Exhibition Road, which seemed the absolute height of elegance even though the outside steps leading up to the restaurant was like the side of the mountain to me. I don’t know what the occasion was but I’m pleased to say the Ognisko is still going and still serving very good food. Not only was the idea of dining out almost totally unknown to us, so was foreign food. Maybe as with most people at that time, my introduction to exotic tastes came with the introduction of Vesta chow mein, beef curry and spaghetti Bolognese in the early 60s. These were very basic kits in a box so the box for spaghetti Bolognese just contained spaghetti, Bolognese sauce and a small sachet of parmesan cheese, which always smelt like sick to me. The chow mein was a bit of favourite, though, as it included crispy noodles. It’s almost laughable now to look back on them but they were like food from another planet at the time. Whatever the concern about my health, apart from the odd cold, I was never seriously ill, which my mum put down to making sure I caught measles as a baby more than the series of inoculations I queued up for with my classmates at St Andrew’s. The syringe always seemed enormous and like the kind that might be used for vaccinating horses. Mum was a firm believer that, if we caught measles when young, we would build up our immunity and my younger brother went through the same process as mum invited a suitable child with measles round to play with Chris. He spent, I think, a week in his cot and in the dark while I was instructed what seemed about every five minutes not to make a noise, which the Cullens might have been grateful for. Because we were fairly close to the BBC television studios, the local roads were sometimes used to shoot on location. I’m sure that most people know the entrance to Steptoe’s yard was filmed in Adela Street off Kensal Road. At least one episode of Z Cars was filmed in the area between Bosworth and Golborne Roads, which drew a large crowd of curious children and Hazlewood Crescent was used as the location for a play shown one Sunday evening. The plot would have been hugely relevant as a play today as it featured a fictional country’s embassy in which someone had planted a nuclear warhead threatening to destroy London, which was being evacuated rapidly. You had to use your imagination for that as there was a lot of tooting of car horns in the background and lots of references to the evacuation in the script. Believe or not, most of the houses in the area were impressive architecturally as they were originally built for middle class families and Hazlewood Crescent must have contained houses that were less dilapidated than the majority so that one of them could pass for an embassy in one of the more upmarket parts of London. The street was full of glaring arc lights, trailing cables, impressive cameras and vans full of equipment and, of course, crowds of curious children. The side streets between the canal and the railway line, where there was less traffic than on Kensal and Golborne Roads, were usually more or less full of children anyway playing, talking, arguing or fighting but usually just playing. Edenham Street was usually my destination of choice as it was closest. Other, more disturbing, events took place in the area including the race riots of 1958, which I had heard about on the grapevine as a five year old and I remember asking my parents about it. I was easy to placate then as they said it was only a party and some people dancing in the street, inadvertently prophesying the Notting Hill carnival that, to an extent, came out of those riots. Also, in about the early 60s, the exploits of Peter Rachman, the notorious landlord in Notting Hill, were becoming widely known and Rachmanism became a common term for the exploitation and intimidation of tenants but my parents considered themselves fortunate to have the gentlemanly Mr Sohacki for a landlord who allowed my dad to chop up his old furniture and decorate our flat more or less as he pleased. 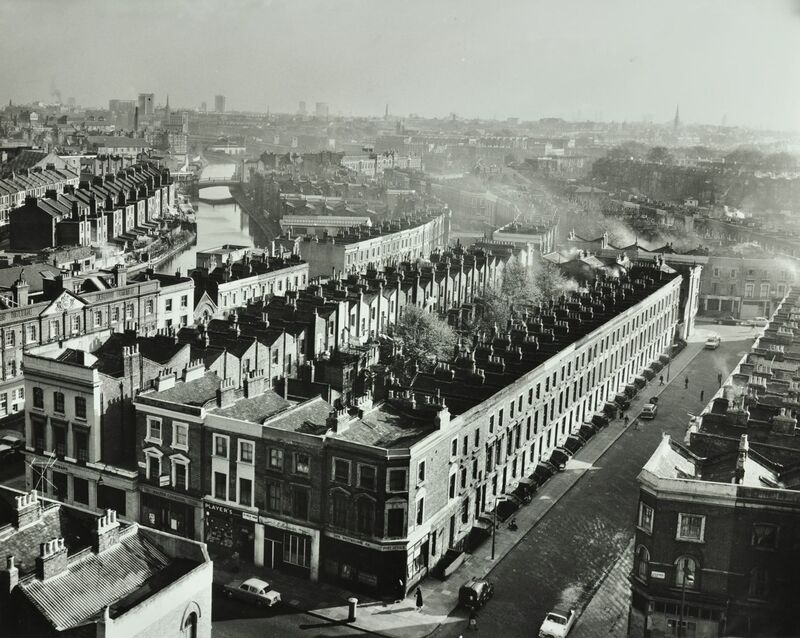 Even though the Rillington Place murders came to light in the early 50s and the street was renamed Ruston Close soon after, it was still a bit of a minor tourist attraction for years after and people walking past along Ladbroke Grove would sometimes slow down and look or point at the notorious number 10. It’s been difficult to put the names of friends to these stories and only have a list of disconnected Christian or surnames in my head. I suppose this is a consequence of my having not given those North Kensington days much thought over the years until the last few weeks and I regret that my recollections aren’t as detailed as some of the posters on this site. Kevin Magill, Maurice Condon and Sandra King are about the only names of children I remember going to St Andrew’s school with and I remember three sisters in Edenham Street, one of who was Linda Murray who I may have gone to school with. An Italian friend, Pompeo Pompeii, who lived along Kensal Road near the swimming baths and who went to St Andrew’s with, stands out for me as I remember being invited to his house and being offered a small glass of dry white wine and a small plate of biscuits, which I thought was a bit strange. I wasn’t sure I should be drinking alcohol although, at Pompeo’s mother’s instance I did even though I’m sure I would have preferred a glass of Tizer. My parents explained that this was just a tradition and I was right to accept. I also remember Michael Hedges as a friend from primary school days. He lived in an upper storey flat somewhere off Kensal Road and his family were then moved to a prefab in the area. I was quite impressed with the prefab and the idea that a family could have a whole detached house surrounded by a garden all to themselves even though it was tiny. Like a lot of parents in the area I imagine, mine wanted something better for themselves and their growing sons. Even before my brother was born, I recall my parents talking about emigrating to Australia as it was possible to go then on an assisted package for ten pounds. My mum’s uncle and aunt and their families had emigrated and settled in Melbourne after the war and my dad had already effectively, albeit forcefully emigrated from Poland so this was a realistic possibility. We went one day to Australia House in the Strand to get more information but, for whatever reason, they decided not to although their wish to move out of North Kensington continued to come up in conversation from time to time. About a year before we moved, the Bird family, who referred to themselves as Anglo Indians, moved in next door having recently arrived from Calcutta. I was struck by how well they and their children spoke and how well behaved their children were, in contrast to most of the boys and girls I usually hung around with. However, it was Jackie with her long dark hair and who was thirteen, a year older than me, who made the biggest impression. It was more than fifty years ago and memory plays tricks but I think the feeling may have been a bit mutual because she would often come round and we would sometimes sit and talk and giggle on the sofa in an only semi innocent way. 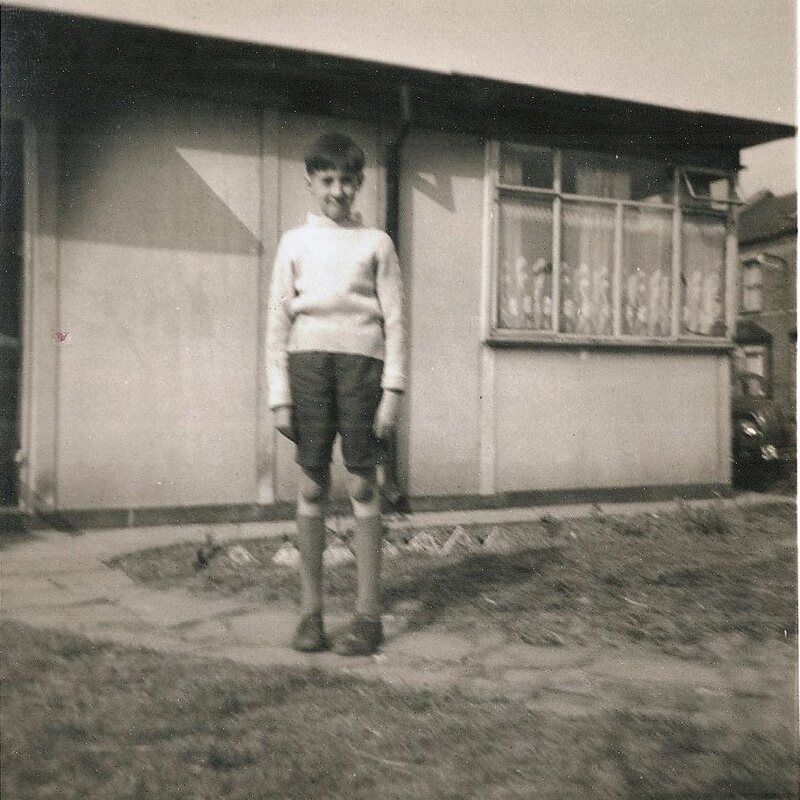 About that time, dad had the option to relocate from his office in Carnwath Road to a new one in central Croydon and so it was that I turned thirteen and, three months later, one day in late May 1966, in a slightly less dramatic move than emigrating to Australia, we moved to Croydon. This entry was posted in Canal, Churches, Golborne, Schools, Shops, Streets, Uncategorized and tagged Adela Street, Edenham Street, Golborne Road, Harper’s, Hazelwood Crescent, Kensal Road, Portobello Road, shops, St Andrews, St Helen's, Trellick Tower, Wardle’s, Westbourne Grove. Bookmark the permalink. Brilliant post Roger. I will reread at leisure. You have jogged my memory on things but I have been lazy about writing lately. hi Roger, great recall. I went to St. Andrews school between I think 1956 to 1959. I recall the headmistress was a large woman who liked to cane children. She had taught the mothers of the children who came to complain of her whacking their child. Was her name, Mrs. Thompson? I think the deputy head, Mr. Brackley became the headteacher in due course. I remember a teacher Mrs. Pellici – I have a photo of her with my school friends visiting the Tower of London. We all sat on a cannon by the Thames. Having watched Wolf Hall, I remember being taught about the Tudors and Henry V111. Does anyone share these memories? I’ve got one more post pending mostly about St Andrew’s including a couple of pics of the old school. When it gets uploaded, Richard, you will see that I mention Mr Brackley and you only just reminded me, though he didn’t give me the cane, I got several detentions for fighting. Those memories are still trickling out but they are buried deep. I only remember Mr Brackley as headmaster. I don’t recall Mrs Pelluci either but I just remembered Miss Bliss (I kid you not) was our teacher in the infants’ class. We went to the Tower of London too. I’ve said in my post still to be uploaded that it was secondary school but, now that I think about it, it was probably St Andrew’s. Yep we all sat on the cannons, would love to see your pic. Why not write a post too? The whole class also climbed up the Monument and what a view from the top! I walked up again last year for only the second time(!) and it’s almost surrounded by skyscrapers now. To Steven – I don’t know if you can zoom in on the second pic (looks like it was taken from the top of Hazlewood Tower) to see what looks like one boy sitting on top of another one just down from the post office. I’ve thought that could easily be me being sat on or doing the sitting – and/or that could be you or your brother! I’ve not been very good remembering names in my posts so we could well have played together but I don’t think we always bothered with names. It seems to me that, if there was a game of football going on, you just joined in or if there was a go kart to be pushed, you just did it. Almost my whole 1962 world is in that pic. The post office, Wardle’s, the Britannia, the top of the chapel opposite our house in Kensal Road and, to the left, the knitwear factory, Great Western Road bridge over the canal in the distance, even I swear Ada Smith’s white Ford Zephyr at the very end of Edenham Street. She told me off once just for leaning on it! To Gwen – together with my almost by chance walk around North Ken before xmas, your posts on here started me off on this process so big thanks!!. My parents lived in Hazelwood Crescent, and lived next door to a family called the “Hedges” The lady used to babysit for me and my siblings when mum and dad went out (which wasn’t often). Great to hear the old street names, Golborne Road,(pre Trellick Tower). I remember a shop on Kensal Road called “Richards” next door to “Oliver Toms” a big red brick building / factory that seemed to stretch along Kensal Road. The Steptoe scrap yard, Minder, Sweeney, the Bill, even Fools and Horses were filmed on those streets in later years (Albert falls down a pub cellar) 🙂…..the old Prince Arthur I recall. St Marys School, East Row, the bus garage where we’d sneak in and pinch the ticket rolls and search for coins down the seats. I remember a friend from the Avenues actually got in the cab and started the engine of one! The park at Hornimans, the adventure playground, the chip shop over the iron bridge…. He used to sell single fags to kids, but he wasn’t he only one. Will put some old photos up soon. Regards John. Good memories, John! I’ve just sent a message to Michael to let him know you might remember him, as I’m back in contact with him now as a result of a blog post. I will upload my of class sitting on the cannon at the Tower of London, Did yo or anyone else recall spending two weeks at the Isle of Weight at Shanklin with pupils and Mr. Brackley in the year I think 1955 from St. Andrews? Also, does anyone remember being part of a Cub Group held in the Churchall next to I think the old St. Andrews Church, when the main Church having been bombed was still a wreck? I think it was the 77th Kensington Group? This would be between 1955 – 1958? And, does anyone remember being a member of a Scout Group whose hut was in the old road that run next to the entrance to the Peabody buildings at the end of Southam Street, where Alan Johnson grew up? I look forward to seeing the photo! Going away anywhere would definitely be something I would remember so, no, I didn’t go on any holiday with the school or remember one being organised. I didn’t go to cubs, just scouts and that was a troop somewhere in Paddington as a couple of my friends from North Paddington school went there, when I moved up to secondary school, so I don’t remember the scouts in Southam Street. I also don’t remember the cub group but, if it was the church hall, would that have been the one in East Row, where we used to go for church services and school dinners? Sorry, I’m not very helpful on that score. You mentioned Alan Johnson and I just finished reading his book ‘This Boy’, which covers all the places, events and general way of life I remember and a lot that I don’t. He made a mistake about St Andrew’s though as he wrote that it was a Catholic school and that we had uniforms but those are small points and overall I thought it was a great read and a book I’m recommending to anyone who will listen! It was also a terrible story about his tragic childhood, which made me feel very lucky to grow up in a stable home (not the kind you keep horses in, it was W10 so thought I should point that out). Roger, I was the person going to St Helen’s church with you. I had the same incident on the zebra crossing. I went to St Andrew’s school with my elder sister Carol. The headmaster then was Mr Brackley. Oddly I remember my first teacher being Miss Bliss. I lived at 24 Golbourne Gardens but moved to Bramley Road during the slum clearance period and went to Thomas Jones school. I moved back after a couple of years into Bosworth House, then Adair Towers and lastly Trellick Towers where we were one of the first families to move in.. I then moved away from the area. I actually recall going to your house close to the vets. I also remember Kevin and Michael Bird. The Italian person you mention was I think part of the Vacca family who lived at the top end of Kensal Road. I am still in touch with Tomasso (Tom) Vacca. He and his younger brother Antonio went to St Andrew’s before moving on to Cardinal Manning secondary school..Antonio sadly died some years back. I am also still in touch with Graham Wheeler who lived in Bosworth House but went to Oxford Gardens School. It’s still a small world. Although I had many family members in the area – mainly Crawley’s and Moroney’s, Many have passed on but the children and grandchildren live in west London and Hammersmith. My sister, Carol, still lives in a house similar to those in Golbourne Road but with the benefit of a bathroom. Your recall is excellent and your report has brought back many memories. I will try and dig out some photos. I think I have a picture of the boys in my class in some form of headgear from about 1963. I also have a photo of the choir from St Helen’s church following the marriage of a choirister. The picture appeared ion the local paper. Robert, I am completely blown away by your message, which has filled in so many missing pieces. Amazing doesn’t even begin to describe it that you are and I now talking about that incident on Ladbroke Grove from about 1965? I can’t wait to see those photos!!! I’m not sure there is a facility to post them on here but, if you are on Facebook, you can post them on The Notting Hill & North Kensington Photo Archive or The Old Notting Hill & North Kensington Photo Archive but you will need to join, which is easy enough, as I can’t find you on either members’ list It gets even better because I have found Barbara Murray and, indirectly, Maurice Condon, from St Andrew’s on Facebook in only the last hour!! I hope we can catch up with again very soon. Barbara has suggested meeting up so, if this doesn’t all seems a bit sudden, it would be great if you could join us! Roger, I have found the picture taken in the playground of St Andrew’s school. It is of 10 boys dressed in red Indian head gear. I will try and get it scanned on to one of the sites you mentioned.. I think Maurice Condon is standing bedside me in the photo. The picture of the choir does not scan very well as it is very tatty. A note on the back suggests it was 1962. I do remember Barbara Murray as she was a friend of my sister. Re a comment from Richard Wilkins about a scout group in the area. There was a cub and scout group based at the top end of Kensal Road (Ladbroke Grove end) which was the 66th Kensington. I think it folded when the troop leader met a New Zealand girl who was the cub leader. They ended up getting married and moving to NZ. I would be happy to meet up and bring some other photos along. I live on the south coast now but am happy to make the journey. What is the best way to make contact? Hi Robert – I hope you pick up this message in good time. I have just spoken to Barbara and, to cut a long story short, we have settled on Friday 19th June. Hopefully we can make direct contact either via this website administrator or FB and I can let you know where we are meeting. Between Barbara and I, we should have at least three others along. Hope to catch up with you soon! Roger, if you can get the time and location details to me I will try and make the meeting. I have now joined FB, under the name Bob Crawley, which should make things easier. I am still working out how best to use FB! Interesting read. I have vivid memories of Kensal Town. Born in Southam and left in 62 ( Marriage) I had a great time growing upon such a lively and life forming environment. Hi Ted. Did you live next door to the Earl of Warwick on corner of Southam street and Golborne Rd. All the best Allen . hello ted did yoy have a brother name billy if so he was amate of my brother billy mills there were a few burtons in southam st all related i was friends and went to school with the hendons and shiekies sandra. I wrote this post six months ago completely from memory after having hardly thought about those days for fifty years. I’ve since had the benefit of about five months’ membership of three W10 FB groups and visited the area three more times so, looking back, it’s interesting to see how my memory distorted certain things over time. I’ve also been able to make contact with or meet up with a few names I referenced in this post, Michael Hedge, Mossy Condon, Barbara Murray, who I somehow mixed up with her friend Linda, and the boy I nearly got run over with in Ladbroke Grove, whose name I couldn’t remember, Bob Crawley. It wasn’t a bad first time effort but, for completeness, I should correct or add the following – it was Wardale’s not Wardle’s, at number 5 where Trellick Tower is now; Ada Tyne not Smith ran the sweet shop in Kensal Place, again demolished to make way for Trellick Tower; the toy shop was Harper’s, where they also sold records; it was Bob Crawley who persuaded me to join the choir and we also got sixpence for every service we attended; the fish shop was the Bridge Fish Bar, the first shop on the right over the iron bridge; the television play, part of which was filmed on location in Hazlewood Crescent, was ‘The Crunch’ shown on ATV on 19th January 1964, I understand it still exists and I’m trying to track down a copy; Rillington Place was off St Mark’s Road not Ladbroke Grove, roughly where Bartle Road is now; Linda was Barbara and lived in Southam not Edenham Street; and, finally, Michael lived in Hazlewood Crescent an moved to a prefab in Tredgold Street near Latimer Road. On the other side of East Row from the little rec was the bombed out St Thomas’ church and next to that the church hall, which is still there, now next to the modern St Thomas’. We used to troop in a crocodile as schoolchildren from St Andrew’s C of E primary school, where I went from 1958 to 1964, to the church hall for occasional services. As well as a daily school assembly and R.E. classes, this ensured that we received regular exposure to religion whether or not our parents went to church. Those occasional services included carols just before Christmas and Harvest Festival. I may be wrong but it seemed that very few children, if any, didn’t give a gift of food of some sort for Harvest Festival no matter what their family circumstances. The church hall was also used for school dinners as St Andrew’s was often known as the doll’s house for the good reason that it was tiny and didn’t have the facilities to provide food. St Andrew’s sat in the angle where Southam Street took a sharp right turn and became Bosworth Road with the playground lying between the school building and the railway line, bounded by a high brick wall. Although football was a favourite game at playtime with the especially useful basketball posts at one end of the playground acting as goalposts, an overly enthusiastic kick in the direction of the railway line always brought about an early end to the game. The playground would be periodically enveloped in smoke, which drifted over the wall from the passing trains. The iron bridge in Golborne Road was another favourite spot for getting covered in smoke. As an aside, there was a gap in the buildings at the Ladbroke Grove end of Wornington Road, which was sometimes populated by small boys with notebooks enthusiastically jotting down the serial numbers on the trains as they rushed by. Other playground games normally involved a certain amount of running about and good natured wrestling such as British bulldog and other tag type games, for boys anyway. Girls’ games seemed to involve doing something soppy like skipping, handstands and throwing balls about. There was an annual sports day at the end of each summer term in the playground, which included various running races and a high jump competition involving a portable high jump and a coarse horsehair mat to land on. The children with a highest pain threshold usually won that and I remember one year one boy jumped over in a Western roll before crashing into the thin mat time and again until he was only competing against himself as the bar was positioned higher and higher. Maybe he felt no pain. Real as opposed to play violence occasionally broke out in the playground in the form of fights when most children would stop what they were doing and rush over to watch the entertainment before the teacher on duty stopped it, but fights sometimes also took place after school outside in the street as there was less likelihood of getting caught and punished. I’m sure that fighting, among boys at least, was always limited to fist fights and always one to one. I don’t remember anyone being kicked while on the ground or being beaten by several boys. More often than not, a large contingent of mums, including mine, walked their little treasures to and from school and were usually outside the school gate waiting, which could be guaranteed to put an early stop to any fighting anyway. The other main after school attraction was the sweet shop opposite the school, which sold small glasses of pop for a penny. The girls weren’t averse to fighting and seemed to be less scrupulous than the boys as I remember a girl coming back from break time one day crying and carrying a chunk of her dark brown hair, which had been pulled out by another girl, and, in one art class when we were entrusted with scissors, one girl stabbed another one in the leg. It wasn’t always just fighting though. Very few children qualified at St Andrew’s but any ‘fatty’ or ‘four eyes’ could expect to be picked on, likewise anyone whose personal hygiene was noticeably below the norm was a ‘fleabag’, which was fairly common as quite a few families had limited access to washing facilities. Any arguments or fights were usually soon forgotten about though, and I don’t remember any grudges that lasted more than a day. I’m sure I was never given the cane but I was given several detentions for fighting and the sound of my classmates running around having fun in the playground while I sat and read in the classroom was punishment enough. Just at the entrance to the playground was a raised flowerbed, which was always filled with beautiful bedding plants in the summer and, at that end of the playground, were the boys’ and girls’ outside toilets. Although, the toilet wall must have been about five feet high or so it seemed to me then, because there was no roof on the toilets, there was sometimes a bit of a competition among the boys to see who could pee over the wall. That may have been why the girls avoided playing anywhere near that wall. The first Clean Air Act was passed in 1956 but smogs were still an occasional problem in winter in the late 50s and early 60s. Often, my nose and mouth were bound in a huge scarf to act as a filter, with instructions not to take it off until I was inside school. My mum’s paranoia might have been understandable although not appreciated by me, as my dad worked full time at a bakery before he joined Limmer and Trinidad in 1957. He used to cycle in all weathers, often in heavy traffic, to and from the bakery and, one winter, it proved too much and he collapsed in the street and was taken to hospital where he stayed for, I think, two months. I mentioned before the various vaccinations we were given at school with what seemed to us then an enormous syringe. Much more pleasant was being given polio vaccine on a sugar lump although we were given that only once unfortunately unlike the foul tasting iron capsules that we were given on a regular basis. We also had regular visits from the nit nurse so, thinking about it, there was quite a lot of medical care at school. Anyway, on one visit the nurse discovered that, no surprise, I had head lice and my mum took charge by washing my hair every day with some special shampoo. I think the head lice died by drowning. I don’t think I really felt the cold in winter, either because I was trussed up like a mummy or because I was running around or both at the same time. The coal fire, and later the electric fire, in the front room and the smelly paraffin heater in the bedroom, sometimes transported to the kitchen or bathroom, kept us fairly warm. For some reason, my mum always seemed to go shopping without an umbrella as we often seemed to spend a very boring age sheltering under the awnings of the shops in Golborne Road waiting for the rain to stop. Heavy rain brought a different problem at number 89 as, at least on two occasions, the Cullen’s basement flat was flooded. In the high summer though, the air in the streets and indoors could be stifling and the buildings and tarmac seemed to magnify the heat although it never stopped me running around. At home, the milk curdled on a regular basis, even though the bottles were placed in the kitchen sink filled with cold water and, opening the windows was always a two edged sword as it might bring in a feeble breeze but it was sure to provide an endless supply of flies with easier passage to the kitchen. We never went away for a holiday although, for mum, me and later Chris, there was some respite during the long summer holidays as, for about four weeks each year, we were always packed off to stay with our granddad, who had been a widower since 1958 and therefore lived on his own. He lived in Northfields and had a garden and, better still, there were several large parks nearby. The woodland by the canal close by was a place of adventure and much less forbidding than the canal at the back of Kensal Road. The roads were lined with trees and all of the front gardens were filled with shrubs and flowers. It was an alien and wonderful environment for us where the air actually smelt fresher and it was more common to see bees, spiders, butterflies and beetles than the flies of Kensal Road. When we returned home, usually about a week before we were due to return to school, usually another piece of Mr Sohacki’s old furniture would have replaced by a sleek 60s number or there would be the strong smell of gloss paint as one of the rooms had been decorated. The infants’ class at St Andrew’s was on the ground floor at the end of the building closest to the entrance to the playground and was led by Miss Bliss. Lessons usually involved a lot of drawing, painting and playing in the sandpit, which was on a large table in the classroom. The next class up was next door on the ground floor and so on until you got to the road end of the building before being ‘promoted’ to the first floor when classes started next to headmaster Mr Brackley’s office, which overlooked the road, before migrating towards the back of the building for the final two years as the oldest two classes were combined. Year on year, lessons included less play and more reading, writing, arithmetic, history, geography and R.E. of course. We were taken out for school trips from time to time and once went to the Science Museum. At a time when museums seemed stuffy and full of boring glass cases, the children’s gallery in the basement was full of interactive displays. There were pulleys to pull, which was like a test of strength, and working models operated by small brass handles on the outside, which we would turn as fast as possible although the models inside still moved at a snail’s pace. There was also a booth with doors at either end operated by photoelectric cells, which we all delighted in crowding into and out the other side repeating the process several times. I was hugely interested in what was referred to as the space race at that time and, later, when one of the Mercury space capsules went on display at the Science Museum, mum and dad took me back there and this probably included more running in and out of the booth with the photoelectric cell operated doors. Other school trips included a day at the Tower of London. We all climbed the steps of the Monument that day, something I did for the only the second time last year and, as it was one of the tallest buildings in London at the time, the view was far more spectacular then. One evening before one Christmas, we were taken by coach to Westminster Central Hall for a schools carol concert, the first time I had ever been inside such a huge and impressive building. In the later classes, we were entrusted with inkwells and pens, which were just a nib on a stick. It was a responsible job to be ink monitor, which required a very steady hand. It was also quite a job to get the ink to form words on the page and to avoid getting ink on hands, face, clothes and everywhere else. Being milk monitor was an easier job as it just entailed handing out the small bottles of milk from the crates, which were sometimes placed by the radiator in winter to thaw them out. The school had a lending library, which operated during some break times in one of the classrooms staffed by other responsible pupils acting as librarians. Another source of books for me was the lending library in Ladbroke Grove, which my dad enrolled me into at about this time. We always walked there together to change our books and I was always struck by the heavy silence inside, broken only by light footsteps and the librarian stamping the books. A walk to Ladbroke Grove that filled me with dread, though, was going to the dentist, whose surgery was quite close to the library. My screaming, when I was first given gas for some fillings, must have made the patients waiting their turn outside think I was being tortured but somehow the dentist persisted and did his job. I remember being quite bright compared to most children in my class. I still have some book prizes from those days with an impressive looking London County Council certificate inside signed by Mr Brackley. Somehow they have followed me around and survived various moves. Unfortunately, my parents were a bit dismayed when I failed my eleven plus in 1964. If the exam had included any subject other than maths, I’m sure I would have passed but I couldn’t remember my tables or add up a column of numbers and get the right answer if my life depended on it. So it was that I went to North Paddington on the other side of the canal but that’s another story. You lot have just brought back so many memories of that era which were great & happy times of my youth, Mossy Condon, Michael Daly, Billy Wateling Greg Naylor,to name but a few, there were many more but I cannot remember. I am Brian Fenton & had an older brother called Richard. We were the only half cast/ black people around in them days that lived in Kensal New town, wow 45+ years ago. Thanks for the comments Brian. Since I wrote this last year, I’m pleased to say I’ve met up with Mossy a couple of times for the first time in 50 years. They were happy days as you say. All the best. I lived in Wornington Rd during the 60’s at no22, they were good days. I still live in North Kensington, my name it is Salvador Garcia alias Kiki. Hi .in your post . You said that you lived at 22 Warnington road .I had a ex girlfriend in 1958 . Her name was Rita Allen she had a friend her name was Maria Garcia .she had a brother called Joey.Did you know them. All the best Allen. Clearly taken in the park. Where was St Andrews school located? Was it demolished? I cannot find out much about it. Hi Krys – me again! Thank you for the compliment. You definitely went to St Andrew’s based on that school photo taken in the little rec as we’ve identified ten out of the 26 children in the photo. I talked to someone else a few months ago who was brought up as a Catholic but went to St Andrew’s as there weren’t any places at St Mary’s and that may have happened to you. I don’t know how well you know the area as it is now as it’s changed a lot but there are two ways to describe where the school was. If you imagine what’s left of Southam Street continuing west until it intersects Bosworth Road, the school stood on the outside of that right angle. Alternatively, looking at the new school, St Thomas’s, in Southern Row, the old school stood on the railway side of that building in what is now the playground. I visited the school a few times earlier this year as part of their local history project and at least the original playground wall is still there on the railway side. I’ll tag you on in a few minutes to help you get your bearings.